Made of Solid stainless steel (including chain), Free of nickel and lead. High resistance to rust and corrosion. Make for Sensitive skin, Hypoallergenic, Comfort Fit. Minimalism style, unique design by TOUGHARD. Letter from A to Z, High polish finish surface shiny like a mirror, Cute and elegant pendant necklace set. Four colors for choice: Gold, Rose Gold, Silver, Black. Mini delicate letter pendant suitable for teens, children. 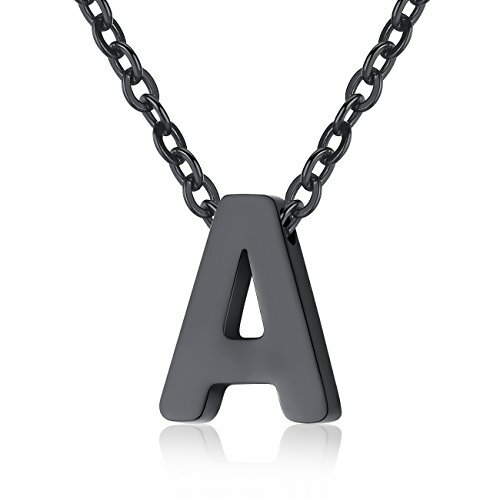 Letter “A” Pendant size – Height: 11mm; Width: 8mm; Thickness: 3mm. Chain length: 16 inch + 2 inch extending chain.